Fragola, a broadcasting and film profressor, links seven light and likable stories about growing up Sicilian in Syracuse, New York, a subject familiar to readers of Jerre Mangione’s classic Mount Allegro, which shares the same nostalgia for a lost way of life in nearby Syracuse. These elegiac fictions focus on the relationship of a boy and his immigrant grandparents, especially his grandmother, with whom he spends most of his time, since both of his parents have to work. 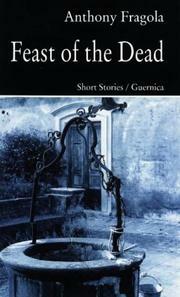 In —Feast of the Dead,— the grown-up narrator remembers Gram’s cooking and sayings, along with his youthful resistance to her old-country ways and superstitions. Despite himself, he comes to recognize the ghost of his maternal grandfather, long gone, as this specter inhabits the boy’s body on All Hallow’s Eve. Until he’s seven, the narrator sleeps with Gram (—In My Grandmother’s Bed—) and even conspires to prevent her remarriage, which would take her away from him. Later, she convinces him of the evil eye’s power (and tells how to counter it) and also teaches him how to i.d. a witch (—The Evil Eye— and —La Strega—). His sadness for the passing of tradition surfaces in —Ceci-Nuts—: he realizes there’s no one to replace the old couple who—ve sold roasted beans for years on end at the annual feast. In the moving memoir of his paternal grandfather (—The Garden—), the narrator finally comes to understand the old man’s bitterness, and begins to appreciate his magnificent terraced backyard, which goes to ruin after his death. —In Exile—,the last piece in the collection, smartly disabuses the college-aged narrator of any romantic notions concerning the old country: On a trip there in his 20s, he finds little but squalor and suspicion. Fragola offers family memories in no-frills prose. Anyone partial to the heady aroma of tomato sauce simmering on the stove will want to savor this modest volume; others might be less impressed.